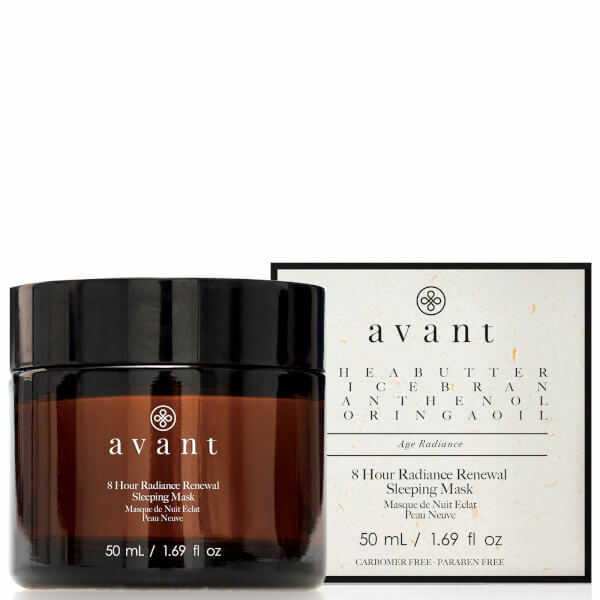 Wake up to a supple, hydrated complexion with Avant Skincare 8 Hour Radiance Renewal Sleeping Mask; a nutrient-rich, anti-ageing treatment that works overnight to repair and regenerate. Fortified with Shea Butter, Rice Bran and Moringa Oil, the antioxidant-rich formula helps to minimise the appearance of fine lines and wrinkles, whilst delivering firming and tightening properties for a lifted effect. A dose of Panthenol (Pro-Vitamin B5) revitalises damaged skin to reveal a smoother, more refined complexion come morning. Skin looks plump, youthful and restored with renewed radiance and a natural glow. Apply face mask to clean, damp skin, as your pores will be more open, making it easier for the nutrients in the mask to penetrate deeply. Jaw: Apply the moisturiser, working from the chin towards the earlobes. Cheeks: Smooth from nose to temples. Forehead: Massage, making smoothing movements from the centre of the face outwards. Final touch: Massage, making circular movements from eyebrows to nose, avoiding the eye contour area. Combine with a serum or facial oil for a more intensive treatment.